York, Maine-Norma Jane Nicholson, 94, of 2 Victoria Ct., and a longtime resident of Franklin, NH passed away Saturday, February 9, 2019. She was born March 24, 1924 in Boston, MA a daughter of the late Edmund B. and Evangeline D. (Reid) deFreytas. 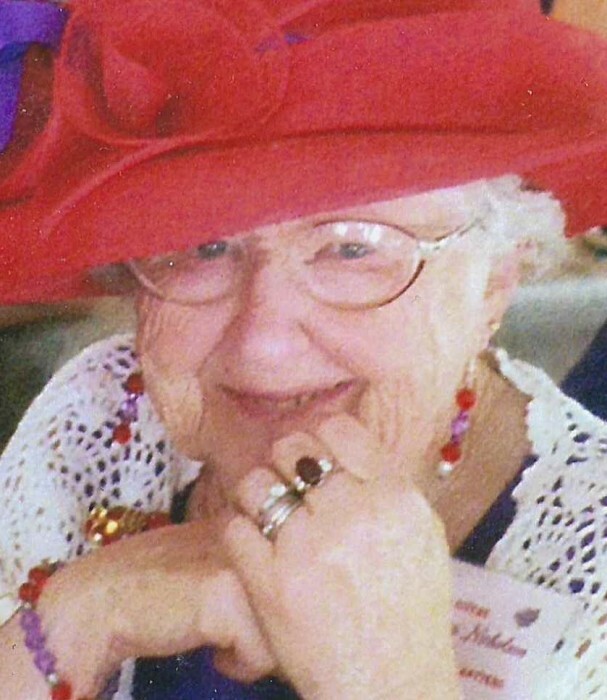 She was raised in Roslindale, MA and had lived in Quincy, MA before moving to Webster Lake in Franklin, N H. She was a member of the Red Hat Society. She enjoyed quilting, traveling, shopping and spending time with her family. She will be remembered as a fun loving woman who loved hosting parties and family gatherings. Her husband James C. Nicholson died in 2011. She leaves a son David A. Nicholson (Eileen) of Elmwood Park, NJ; two daughters, Linda N. Kastner (George) Tampa, FL and Elaine N. Bryn (Steven) of Portsmouth, NH and was predeceased by a son James J. Nicholson; a sister A. Judith Coulter of Toronto, CA; 5 grandchildren Keri Hilton, Catherine Nicholson, Peter Hilton, Karen Giantomasi and Sarah Bryn; 5 great-grandchildren; several nieces and nephews. Calling hours will be held from 4 to 7pm on Wednesday, Feb., 13th in the Lucas & Eaton Funeral Home, 91 Long Sands Rd., York, Maine. A funeral Mass will be celebrated at 10am on Thursday Feb., 14th in St. Christopher's Church, 4 Barrell Lane, York, Maine. Interment will be at 1:30pm in New Hampshire Veterans Cemetery, Boscawen, NH. Memorial contributions may be made to The National WWII Museum in New Orleans, LA. Visit www.lucaseatonfuneralhome.com.